As much as we would like to believe it, and as nice as it sounds, we don’t develop our people out of the goodness of our own hearts. Businesses have important goals and a bottom line, and in order to hit those goals, they need to make money. And if they don’t, shareholders, customers, and employees are all unhappy because the business will likely fail. It might come as a surprise, but employee engagement is nearly as important as the bottom line. Research from Gallup ties engaged employees to better customer ratings, productivity, sales, and higher profitability. These organizations also saw significantly less turnover, shrinkage and absenteeism and quality defects. But only 13% of employees worldwide are engaged at work. Enlightened CLOs, like Sarice Plate of Xilinx and Susie McNamara of General Mills, focus on both the development of skills needed to get the job done as well as engaging employees. 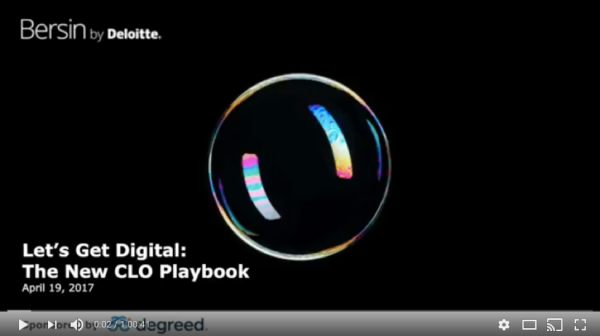 “When employees are excited to learn, they feel more empowered, engaged and productive, and they become more valuable to the business,” said Sarice Plate, Head of Global Talent Aquisition at Xilinx, at a recent Bersin by Deloitte and Degreed-sponsored webinar. But meeting both short-term needs for performance as well as the long-term needs for development requires thinking about things differently, and creating a new learning strategy – one that’s centered around the learner. What does putting the learner at the center mean for your software and tools? It means utilizing systems that support natural human behavior like collaboration, ease of use and personal accountability. In both cases, these leaders put learners in the driver’s seat. Want to know more about the Xilinx and General Mills learning strategies? Check out the on-demand webinar, “Let’s Get Digital,” now.